News. I'm now in the fourth and last year of my PhD, intending to submit my thesis in May 2019 and defending during the summer. Most of my recent thinking is on topics of participatory budgeting, donations, and public goods; drafts forthcoming. 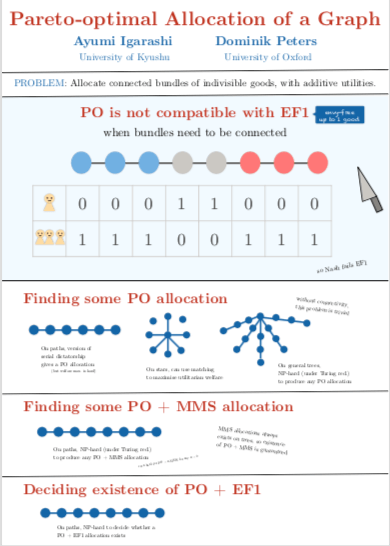 With coauthors, I have new drafts on efficient and fair allocation of indivisible goods into connected bundles. Group Activity Selection on Social Networks. Ayumi Igarashi, Robert Bredereck, Dominik Peters, and Edith Elkind. 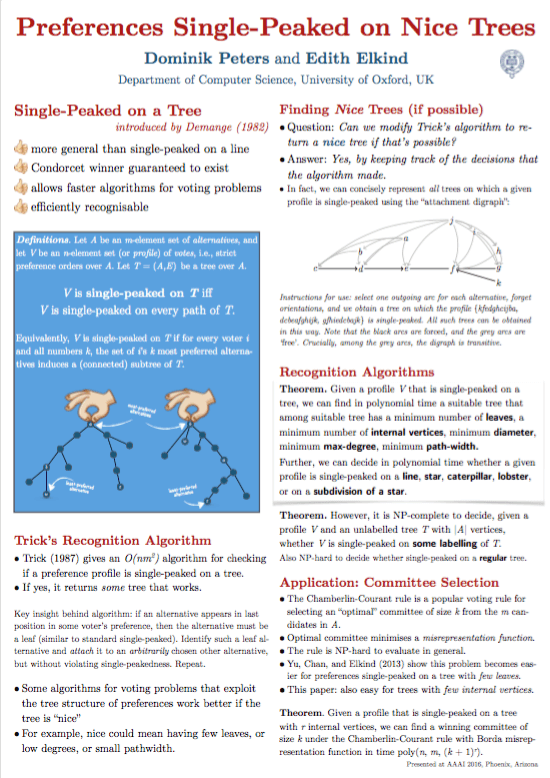 Draft of longer journal version of AAAI '17 paper. k-Majority Digraphs and the Hardness of Voting with a Constant Number of Voters. Georg Bachmeier, Felix Brandt, Christian Geist, Paul Harrenstein, Keyvan Kardel, Dominik Peters, and Hans Georg Seedig. Economic Design for Effective Altruism. Dominik Peters. Draft Chapter for Future of Economic Design (in preparation). Computer-aided Methods for Social Choice Theory. Christian Geist and Dominik Peters. Chapter 13 in Trends in Computational Social Choice. Edith Elkind, Martin Lackner, and Dominik Peters. Chapter 10 in Trends in Computational Social Choice. Haris Aziz, Florian Brandl, Felix Brandt, Paul Harrenstein, Martin Olsen, Dominik Peters. In ACM Transactions on Economics and Computation (forthcoming). 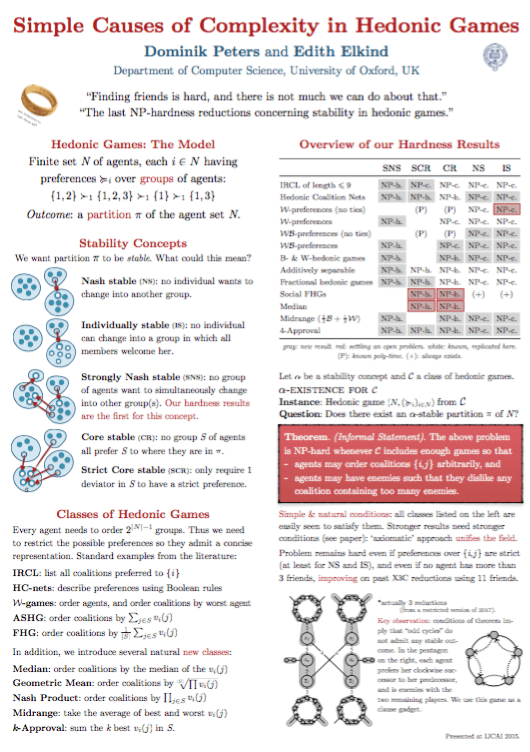 An Axiomatic Characterization of the Borda Mean Rule. Florian Brandl and Dominik Peters. In Social Choice and Welfare (Online First). Optimal Bounds for the No-Show Paradox via SAT Solving. Felix Brandt, Christian Geist, and Dominik Peters. In Mathematical Social Science (2017). 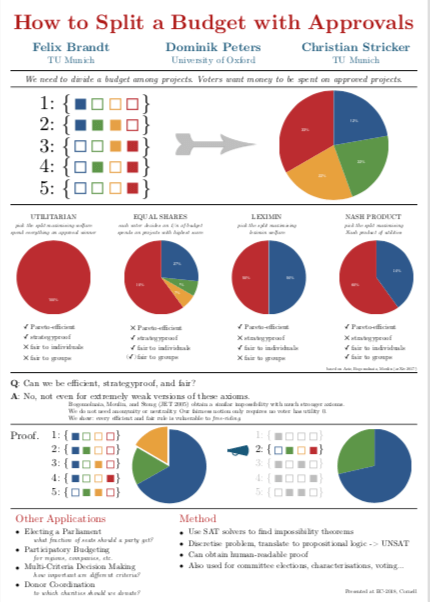 newSingle Transferable Vote: Incomplete Knowledge and Communication Issues. Manel Ayadi, Nahla Ben Amor, Jérôme Lang, and Dominik Peters. In AAMAS '19 (accepted). 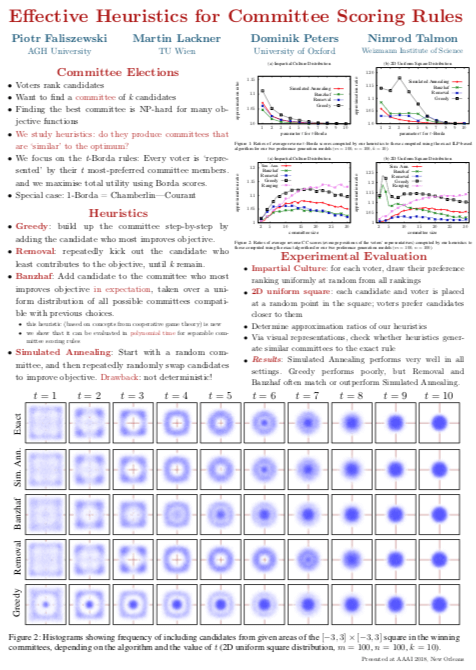 newPareto-Optimal Allocation of Indivisible Goods with Connectivity Constraints. Ayumi Igarashi and Dominik Peters. In AAAI '19 (accepted). Also presented at AI3. newAlmost Envy-Free Allocations with Connected Bundles. Vittorio Bilò, Ioannis Caragiannis, Michele Flammini, Ayumi Igarashi, Gianpiero Monaco, Dominik Peters, Cosimo Vinci, and William S. Zwicker. In ITCS '19. 2018Proportionality and Strategyproofness in Multiwinner Elections. Dominik Peters. In AAMAS '18. Also presented at COMSOC '18. 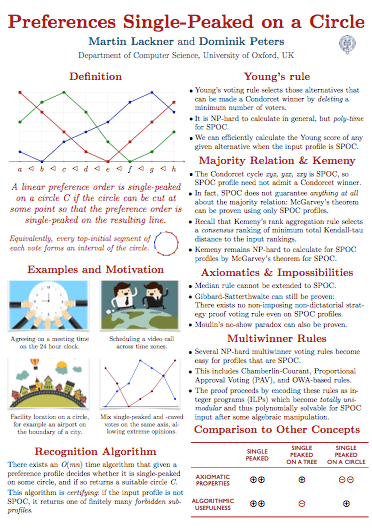 Single-Peakedness and Total Unimodularity: New Polynomial-Time Algorithms for Multi-Winner Elections. Dominik Peters. In AAAI '18. Also presented at ADT '17. 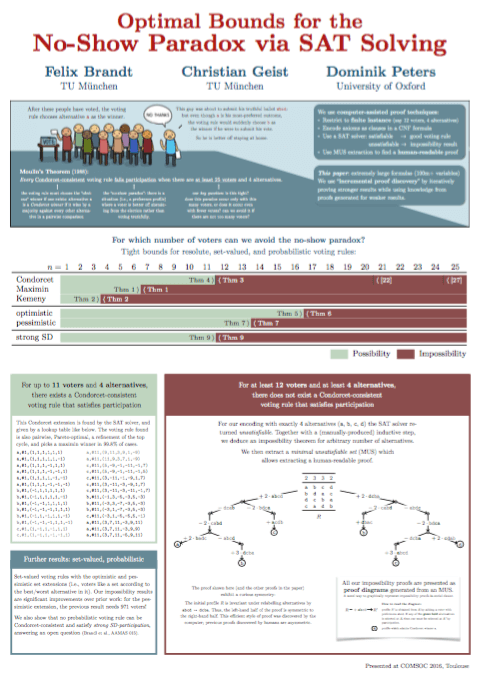 Effective Heuristics for Committee Scoring Rules. Piotr Faliszewski, Martin Lackner, Dominik Peters, and Nimrod Talmon. In AAAI '18. On Recognising Nearly Single-Crossing Preferences. Florian Jaeckle, Dominik Peters, and Edith Elkind. In AAAI '18. 2017Condorcet's Principle and the Preference Reversal Paradox. Dominik Peters. In TARK '17. Precise Complexity of the Core in Dichotomous and Additive Hedonic Games. Dominik Peters. In ADT '17. Fair Division of a Graph. Sylvain Bouveret, Katarína Cechlárová, Edith Elkind, Ayumi Igarashi, and Dominik Peters. In IJCAI '17. Piotr Skowron, Martin Lackner, Markus Brill, Dominik Peters, and Edith Elkind. In IJCAI '17. Preferences Single-Peaked on a Circle. Dominik Peters and Martin Lackner. In AAAI '17. Ayumi Igarashi, Dominik Peters, and Edith Elkind. In AAAI '17. Dominik Peters. In AAAI '17 and COMSOC '16. 2016Preference Restrictions in Computational Social Choice: Recent Progress. Edith Elkind, Martin Lackner, and Dominik Peters. 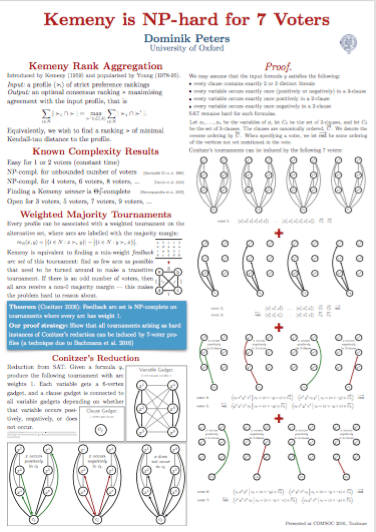 In IJCAI '16 (Early Career Spotlight Track). A. Abeliuk, H. Aziz, G. Berbeglia, S. Gaspers, J. Gudmundsson, P. Stursberg, P. Kalina, N. Mattei, D. Peters, P. Van Hentenryck, T. Walsh. In IJCAI '16. Felix Brandt, Christian Geist, and Dominik Peters. In AAMAS '16 (Nominated for Best Paper Award). Preferences Single-Peaked on Nice Trees. Dominik Peters and Edith Elkind. In AAAI '16. 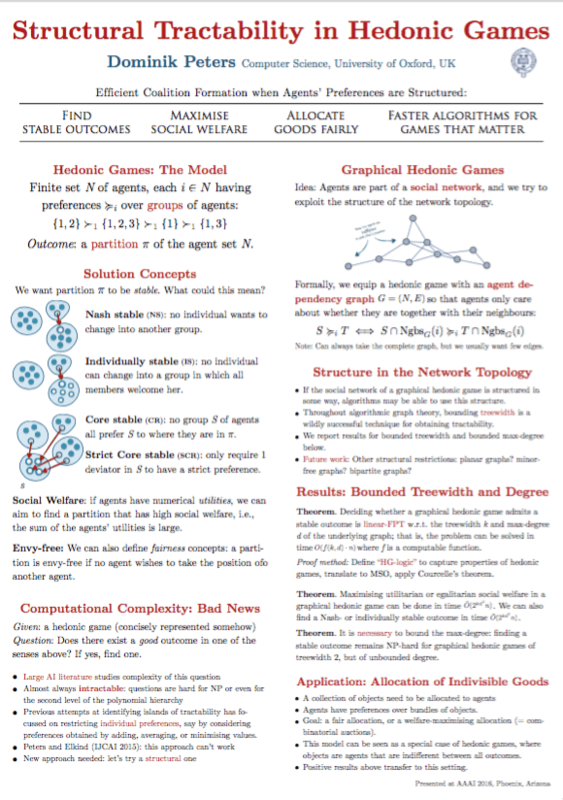 Graphical Hedonic Games of Bounded Treewidth. Dominik Peters. In AAAI '16. Complexity of Hedonic Games with Dichotomous Preferences. Dominik Peters. In AAAI '16 Student Abstracts. 2015Simple Causes of Complexity in Hedonic Games. Dominik Peters and Edith Elkind. In IJCAI '15 and CoopMAS '15. 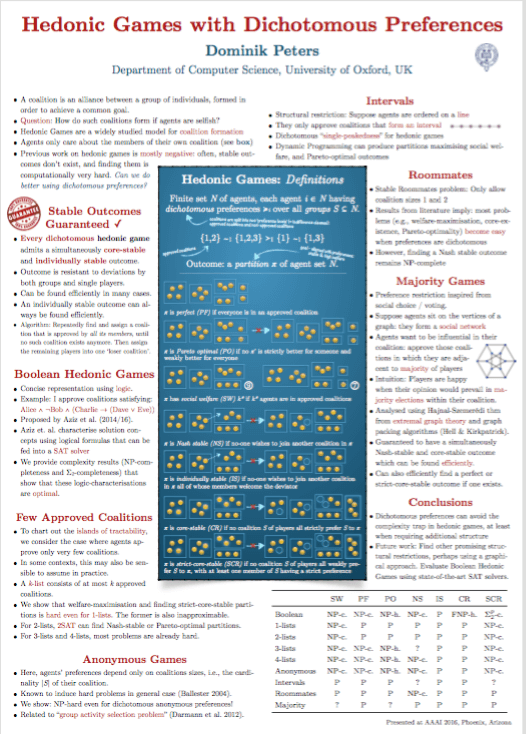 We develop a framework that shows that deciding whether a hedonic game admits a stable outcome is NP-hard for a large number of classes of hedonic games, unifying and extending the previously known hardness results in the field.